"David Scott is an entertaining and informative speaker. His style is most appropriate for audiences to enjoy and he certainly has my personal endorsement as well as the endorsement of the Bay Area Council, Boy Scouts of America. I have been in the audience on three occasions to hear him speak, with each one showing versatility of the subject presented." "David C. Scott recently spoke at the Old North State Council’s Eagle Breakfast and inspired everyone with Theodore Roosevelt’s example of living a duty-driven and Scout-like life. His lively stories and upbeat delivery really brought Roosevelt to life and helped us better understand why the Scouting movement because so popular, so fast. It was a wonderful experience." "David C. Scott is both an informative and entertaining speaker with an amazing ability to capture and retain the attention of our young Scouts and adult leaders alike. His presentation style crosses generations and is entertaining to everyone in attendance"
"The Scouting Party ranks as the best single work available on the leading personalities involved in the creation of the BSA." "This wonderful book is a gift to America." "[The Scouting Party] is the one I have been waiting for detailing that important 1902 – 1915 period in the history of Scouting... it has provided a missing link." "[The Scouting Party] is a thoroughly researched and lively account of these sometimes contentious, always colorful, and mostly good-hearted characters." "The Scouting Party is part history, part detective narrative as it uncovers and catalogues in rich detail the jealousies, intrigues, and earnest efforts of the men who created the Boy Scouts. Through careful research and vivid descriptions, Scott and Murphy have told a story that is fundamentally and uniquely American." "My cup-runneth-over with admiration for Scott and Murphy's The Scouting Party. The amount of primary research conducted by the authors is deeply impressive. But, even more importantly, they remind us that Boy Scouts has been a whooping one hundred year success. Consider this scholarly book a gift to America." "Be prepared! David C. Scott and Brendan Murphy have unsheathed their machetes and blazed a trail through the thickets of the fierce (and strangely delicate) masculine ideals that created the Boy Scouts. The story, with its subtexts of Anglo-Saxon superiority, chivalry, clean living, and military preparedness, explains much about the rough-rider ethos of American life in the early twentieth century. And for their handling of the colossal egos at the center of the story, the authors deserve merit badges in humor and fair play." 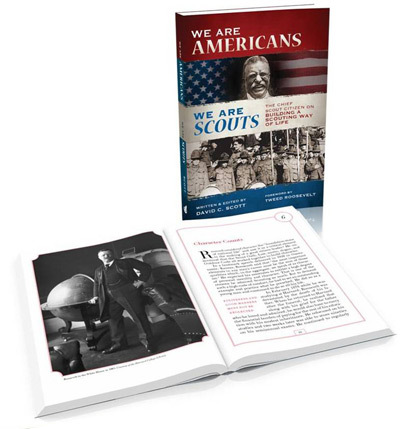 "We Are Americans, We Are Scouts"
"Every Boy Scout should read this collection of Theodore Roosevelt’s thoughts." "I truly wish I [could] place this book in the hands of every American young person between the ages of 10 and 18." 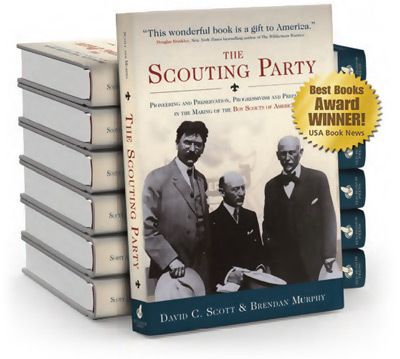 "David Scott masterfully describes the Scouting way of life and connects it to the ideals of President Theodore Roosevelt." "We Are Americans, We Are Scouts will be a valuable resource in emphasizing and promoting the values of Scouting." "What wonderful nuggets of Americanism, citizenship, patriotism, service, and duty to our God and country." "David Scott has brought together the man and the birth of a movement whose ideals span the century between their times and ours. Indeed, this is the philosophy that gave rise to the 'greatest generation' and can make each succeeding generation great."